Therapies for Kids is a firm believer in this statement and so is proud to have the only Enliten Harness System in Australia. 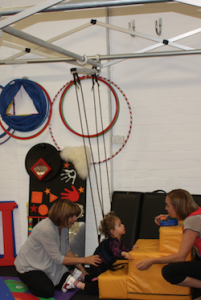 This innovative equipment, provides children with independent movement that allows interaction with family, friends and their environment. 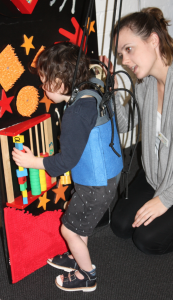 It challenges the therapist’s and the family’s perspective of movement and allows children an improved perspective and quality of life through their experience in the harness. 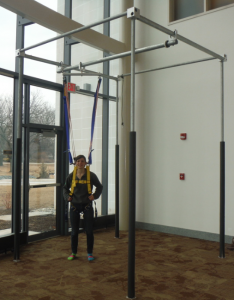 The Enliten Harness System is more formally known as a “fall-arrest and body-weight-support system”. “By enriching the environment within the footprint they begin to learn skills that will help in their daily life as they get older … their physical control improves significantly with this approach — and they have a lot of fun doing it.” says Debbie. In the initial trials which have been conducted at Therapies for Kids since the Unit arrived, many parents have seen how such a system would assist their child to better integrate into the fabric of their everyday lives as well as giving their child greater mobility , independence and confidence. The carefully engineered system includes a patented “travel-car” system which is mounted and attached to parallel rods that enables the user to move anywhere within the footprint of the structure. The user is connected to the support structure with straps that provide no lift when the user is moving but catches the person if he or she starts to fall. A counterbalance or elastic connection between the user and the support structure provides a steady vertical force to reduce the load on the user’s legs. The low-friction, lightweight “cars” provide support wherever the user roams. With all support coming from overhead via soft links, users are free to make choices about their movement to interact with their surroundings with no interference. They can swing a bat, kick a ball,play at a blackboard, carry toys while walking etc. Once a child is placed in it they get all the support they need and can move freely within the footprint of the unit. Interaction with others is basically unrestricted. Finally, here is a way to help kids, with special mobility needs, to walk and play without anything between you and them.